Have your retirement assets doubled since the recession? There is a good chance that the answer is “Yes” if you have been an ongoing participant in a 401(k) savings plan. At least that is what a recently updated study from the Employee Benefits Research Institute (EBRI) and the Investment Company Institute (ICI) suggests after analyzing the performance differences between 401(k) participants who have consistently stayed invested in a single plan and those who have not. Indeed, 6.1 million of the nearly 27.1 million 401(k) plan participants in the EBRI/ICI database maintained accounts at the end of each year from 2010 through 2016 (most current data available). By the end of the sample period, more than a quarter (26.4 percent) of participants in the consistent group had a 401(k) balance greater than $200,000, and another 18.4 percent had between $100,000 and $200,000 in total assets. In contrast, only 10.5 percent of the broader EBRI/ICI 401(k) database, which includes participants and plans entering and leaving, had accounts with more than $200,000, and just 9.0 percent had balances between $100,000 and $200,000. 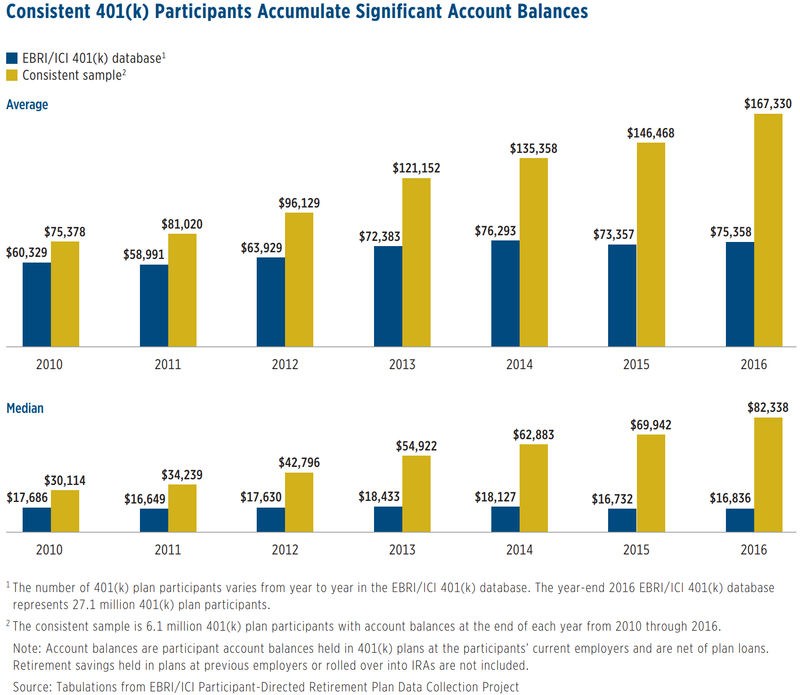 Further, the average 401(k) account balance of the consistent participant group was more than twice that of the broader database ($167,330 vs. $75,358), and the median was nearly five times as large ($82,338 vs. $16,836). 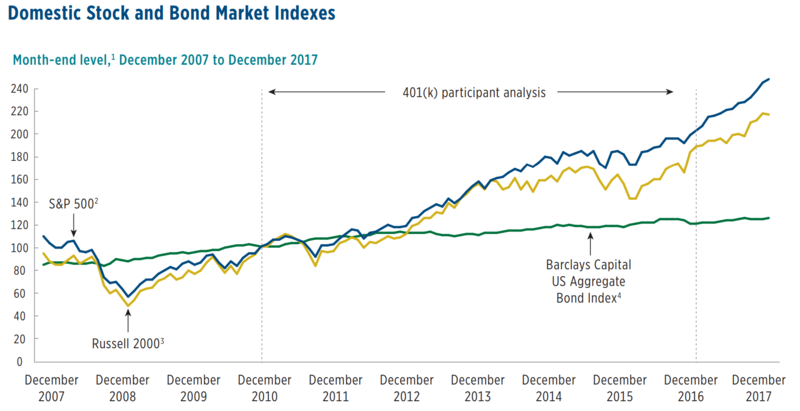 The consistent group’s higher average age and tenure likely helped but ongoing participation still appeared to have provided a noticeable boost to asset growth over the sample period. In fact, the average account balance for consistent participants increased by 122.0 percent from year-end 2010 through year-end 2016, and the median account balance jumped by 173.4 percent. Those gains equate to compound annual average growth rates of 14.2 percent and 18.3 percent, respectively, over the 6-year horizon.